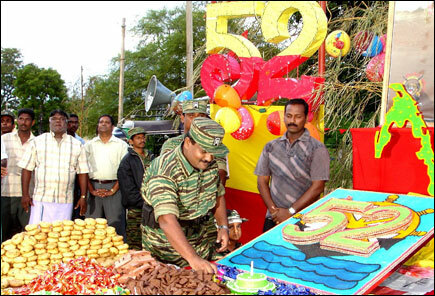 Business Union in Mullaithivu, on Sunday, organised an event to celebrate the 52nd birth day of LTTE leader V.Pirapaharan. Sea Tiger Special Commander Col. Soosai took part in the event where tree saplings were gifted, encouraging the local community to plant trees along the coast, ravaged by the Boxing Day tsunami in 2004. 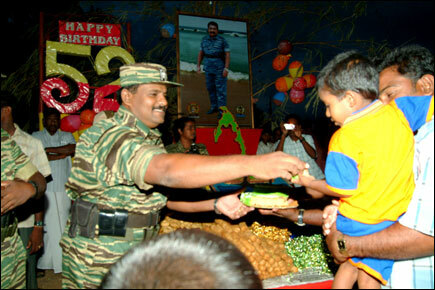 Col. Soosai who attended the event as special guest distributed sweets to the children and families at the event presided by Mr. P. Mano, the Head of the Business Chamber in Mullaithivu. 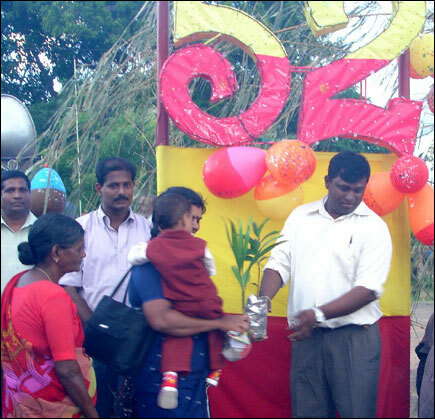 LTTE Women's Political Head Ms. Thamilini and Vanni district Parliamentarian S. Kanagaratnam were also invited to the event held at 5:30 p.m.
Tree saplings were gifted at the event held at Mullaithivu junction, encouraging the local community to plant trees along the coastal area. A Sri Lanka Air Force (SLAF) reconnaissance aircraft circled over the town while the event took place.